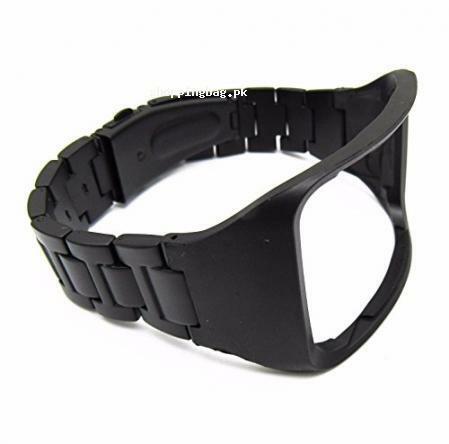 The black stainless steel wristband bracelet with the length of 8.5 inches is special for the Samsung Galaxy Gear S. It is adjustable and easy to use strap with the quality stainless steel in black color. This is the elegant and exclusive new design that goes with all the outfits. This wristband bracelet is for the Samsung Galaxy Gear S SM-R750 that you can buy online in Pakistan with the cash on delivery facility. Place your order now to buy this unique wristband for watch strap to buy this at your doorstep. You can also find and buy more products and accessories for the watches and devices that exclusive and available in our online store to shop online in Pakistan. Here are the Amazon imported products for the consumers in Pakistan. Lose or damage your Gear S straps, Replacements are available. No Smart Watch or other parts!Replacement band for Samsung Gear S only !